Ukraine’s president voiced irritation at the European Union over its push to get his country sign a trade deal, calling the pressure ‘humiliating’. 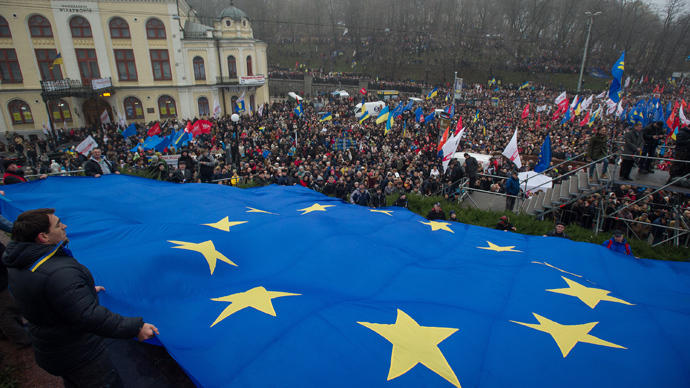 Kiev postponed the move citing vulnerability of its economy and triggering massive pro-EU protests. Ukraine was expected to sign the association agreement with the EU at a summit in Lithuania later this week, but made a U-turn last Thursday. The country’s economy is far too vulnerable at the moment to be opening up to Europe, President Viktor Yanukovich tried to explain on Tuesday in an interview to major Ukrainian TV channels. At the same time the measures that Brussels offered to cushion the blow remain elusive and insufficient, he said. “I am convinced that we should not be begging from poor relatives anywhere. I don’t want to allow and will not allow Ukraine to be humiliated, as long as I lead this country,” Yanukovich said. He mentioned Kiev’s failed negotiations with the International Monetary Fund (IMF) to secure a credit line in exchange for policy adjustments, which the EU said would enable it to offer a 610 million euro ($830 million) aid package. A deal with the IMF would include freezing of pensions and salaries, rising of gas tariffs and other measures, which would hurt Ukrainians, the president said. He reiterated that his government wishes to establish closer ties with the EU, but wants to do it on its own terms at the right moment. Among other things, the association agreement requires that Ukraine overhaul its standards system, harmonizing it with that of the EU. Some 20,000 standards encompassing everything from the size of the bolts for road signs to the railroad gauge would have to be updated. The modernization of the economy would cost $160 billion up to 2017, with $20 billion or more each year spent just for the standards upgrade, according to Yanukovich. A country with a $136 billion debt and a slowdown in the economy, Ukraine may find it difficult to afford such an ambitious undertaking. So Kiev would have to seek foreign aid to fund it, and Europeans, having a vested interest in the integration, are the likely candidates to open their pockets. But Europe itself is currently not in its best economic shape. EU members in the south are convulsing from protests as cabinets in Greece, Portugal, Spain and Italy slash their budget spending and try to deal with record-high unemployment. Union-wide, 125.3 million people were living at the risk of poverty or social exclusion in 2012, according to Eurostat, which is an increase of 7 million from 2010. The idea of footing the modernization bill for would-be member Ukraine may not be welcomed by European voters. Last week’s decision angered many Ukrainians, who anticipated that the country would step on a fast track to eventual membership in the union with all the associated benefits. 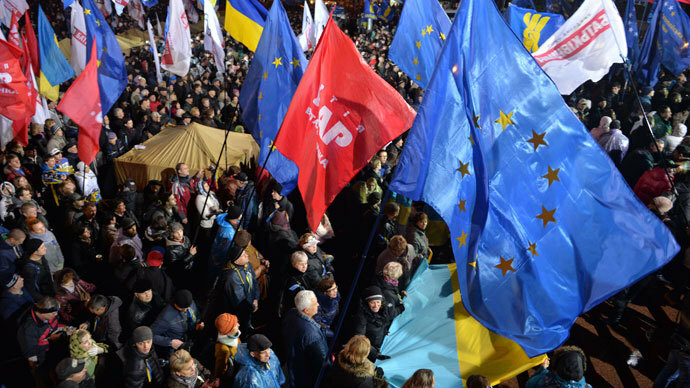 Thousands of people took to major squares in Kiev in a protest against the stalled European integration. On Tuesday night the two protest camps located in the European Square and the Independence Square decided to merge. President Yanukovich said he applauds the opposition protesters, even though he does not share their drive for an immediate European integration. The protests so far were mostly peaceful, although on several occasions groups of aggressive demonstrators armed with pepper spray clashed with riot police, who responded with tear gas and batons. Police on Tuesday warned the demonstrators against siding with some calls on the internet, which advocate storming the cabinet building on Wednesday and overthrowing the government. Some Ukrainian opposition leaders said they plan to visit the EU summit, forming a delegation independent from that headed by the president. While the leader would be busy explaining his government’s decision to postpone integration, the alternative delegation would “represent the position of the Ukrainian people, not Yanukovich” an opposition MP told a protest rally. In the past few days several European officials blame Russia over the Ukrainian U-turn. Officials in EU accused Russia of using the threat of stripping trade preferences as leverage on Kiev. There is also a controversial gas deal Moscow and Kiev signed back under the previous Ukrainian administration, which the Yanukovich government considers extremely unfavorable towards Ukraine. The terms of the gas deal remain a major bargaining chip for Russia. One of the latest remarks came on Tuesday from former Polish President Aleksander Kwasniewski, who co-leads a European Parliament monitoring mission in Ukraine. “For a long time we believed that Ukraine’s determination is strong and that they would not allow a different point of view to be imposed. The change came in summer 2013. The talks became less sincere; there was this feeling of something happening behind the stage. Europe underestimated the Russian factor,” Kwasniewski told TVN24 television. "The EU would be wise to analyze the situation and find instruments, which would be convincing for Ukrainians,” he added. The string of accusations was rebuffed by Russian President Vladimir Putin. 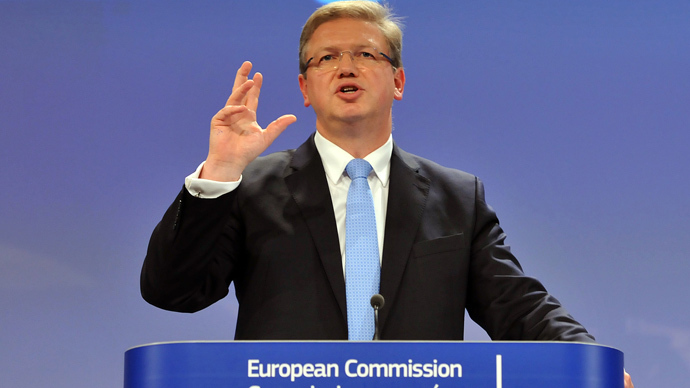 “I would ask our friends in Brussels to refrain from harsh statements. Do they want us to delete an entire sector of our economy just to please them?” he said. The Russian leader dismissed the allegations that Russia’s position is motivated by anything other than legitimate concerns about its own business interests. Putin called on the Europeans to depoliticize the entire situation and reiterated Moscow’s proposition for trilateral negotiations between Ukraine, Russia and the EU to settle differences on the integration effort. The idea is viewed favorably in Kiev, but Brussels remains skeptical and would prefer to deal with Ukraine and Russia in a bilateral format.